2019 is shaping up to look like another busy year for me performing my swing-singing Rat Pack tribute show. 2019 is starting to look like being another busy year for me performing my Swing Singing Rat Pack Tribute style act at various events doing what I do best, which is singing at private parties and events and actually what I enjoy doing the most! I still have several weekend dates to fill and if anyone is planning an event in the week please get in touch. I finally got myself into a recording studio recently and have recorded some new tracks for demo's on my website (it's been awhile since I was last in a studio!) Hope you like them. To have a listen please click on 'Joe's Demos' in the menu bar. It was my first time at this studio and it has only been recently built. The studio is called the 'Roger Luxton Recording Studio' in Rochester, Kent and in fact Roger Luxton the studio owner is also a talented trumpet player and is the band leader for the Roger Luxton Big Band Dance Band. Happy New Year to you all! A big thank you you to everyone who booked me last year. It was one of my busiest years yet! On New Years Eve I was booked to sing at a venue in Sevenoaks in Kent and also provided the Disco and Counted the New Year in for everyone. It was a great atmosphere and everyone enjoyed themselves... Including me! Looking for the perfect Wedding Singer? If you are getting married and looking to book a top class professional Rat Pack Swing Wedding with a DJ option please get in touch now to discuss the various options and prices. You will find the prices very reasonable too! Joe doesn’t simply stand on the stage to perform, he’s out on the floor singing and interacting with party guests. He also formulates a custom crafted repertoire to cater for your guest musical tastes. Whether that be crooning to Sinatra ballads, or singing hip shaking Elvis or Neil Diamond’s rock or playing anything you like! For a no-obligation price quote tailored to your event, contact Joe now! Frank Sinatra, Dean Martin, Sammy Davis Jr, Tony Bennett and Nat King Cole to name just a few. performs an unbeatable repertoire with outstanding vocals. been successfully performing at weddings, functions and corporate events for over 20 years. 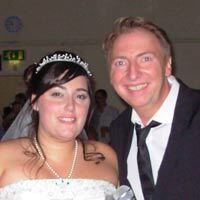 Hope you are well and Thank you so much for coming to perform at our wedding. Having seen Joe perform at a friend's 50th Anniversary in 2014, we were very impressed. When we decided on our date for our wedding, we knew that we would require some entertainment that would cover all age groups. We contacted Joe and booked the full package. On the day, Joe arrived at the Grims Dyke hotel and set up the disco, he made all of our guests welcome. Later in the evening, Joe did his swing routine, this had everyone up dancing (especially the "oldies"). We can honestly say that the comments we received about our day being one of the best was partly because of Joe, some of our friends actually stated it was the best ever music they had heard at a wedding and they all had fun. We would recommend Joe to anyone that loves "swing" and will be keeping his contact details for future events. Thank you very much for a lovely afternoon last Sunday and particularly for singing My way as a toast for my late Father and Uncle as a last minute thing sprung upon you. It was a lovely afternoon, thoroughly enjoyed by all. An enormous thank you to Joe Swing for singing at our family gathering and BBQ this year. We first saw him at another family members reunion a few years ago and ever since have wanted to hear him again. It was a lovely sunny afternoon with the music and singing fitted just nicely and was thoroughly enjoyed by all. The afternoon was made even better, when as a last minute request Joe gave a toast and sang 'My Way' in memory of my late Father and Uncle. Despite not being one he sings often and not having practised it he jumped at the request and you would never know he hadn’t sung it for several years! It was an amazing and emotional moment to hear a tribute to my Dad sung live by such an amazing professional. I even had my Brother listening in on the phone from France. Joe is a wonderful singer, lovely personality and great entertainer and everyone commented on how good he was. We will definitely be having him back again someday, hopefully in the not too distant future. Dear JoeThank you for coming to sing at our party. It was as fantastic as expected. I enjoyed your set so much! There are many brilliant comments coming through to us from the dancers and non dancers alike about your voice! I will certainly let anyone planning a celebration know about you. Also thank you for helping me set up. Wowsers - what can I say that I didn't say the other evening? Thank you so much for an absolutely brilliant evening from start to finish. I couldn't have made a better choice and the compliments from my friends and family are still coming in thick and fast. It was a phenomenal evening all round but your singing was the icing on the cake :) and you are such a lovely man. I wish you every success for the future and will be recommending you to anyone looking for an entertainer. I do hope our paths cross again in the future. Once again, many thanks and please feel free to post any of this email on your web page. Thank you so much for making my party such a memorable night. Your performances were fabulous and really made the evening for me and all my guests. You are a fabulous singer and you knew just how to set the mood and to get everybody up and enjoying themselves. Once you arrived, I just relaxed and left everything is your hands - it was perfect! A number of my friends have raved about how great you were so hopefully you will get a couple of future bookings coming your way! Hope you are well. My apologies for the delay in emailing you-we have just got back from Italy. We just wanted to say a big thank you for your hosting skills at our wedding and your lovely singing and performance. It was exactly what we wanted and you kindly added extra announcements during the course of the day where applicable as well as playing our Irish/Mo town songs. I saw lots of people dancing to your singing - myself included and it was really lots of fun! Thank you for everything and please don't hesitate to contact me should you ever require a reference. Thanks so much for your wonderful entertainment last night. It went down a storm. We got great feedback about how good you were and you made the evening. I'm sure you will be in demand from friends and family! Booked Joe for the second time in a year, this time for a work event. Joe went down a storm as ever and entertained us the whole night with his fantastic singing. The dance floor was full and rocking. Thanks Joe, see you again soon. Just wanted to say a massive thank you for playing at our event you went down really well with our guests and we have had wonderful feedback. We would like to wish you a very Happy Christmas and look forward to working with you next year. your call and discuss your requirements. He would be delighted to hear from you today. 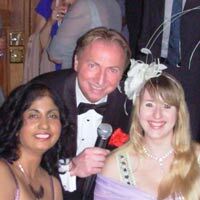 Joe Swing regularly performs as a Wedding Swing Jazz Singer in Kent, Surrey, Essex, London, Berkshire, East Sussex, West Sussex, Hertfordshire and across Southeast England. If you're hosting a party, organising a corporate event or getting married and looking to hire a top class professional Rat Pack Swing Wedding with a DJ option, please get in touch now to discuss the various options and prices! You will find the prices very reasonable too! Frank Sinatra, Dean Martin and Sammy Davis Jr... They were the definition of cool during their 1960's Las Vegas heyday. Combining swing with charisma, panache and swagger, the trio were best known as 'The Rat Pack', and had attitude to spare. Looking for a Rat Pack vocalist in Kent? Look no further. 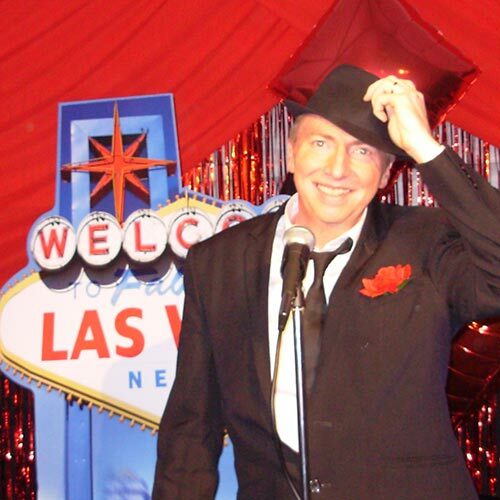 Joe Swing has been singing classic Frank Sinatra, Dean Martin and Sammy Davis Jnr. songs from the 50's/60's for over 20 years. From Thanet in Kent, Joe performs not only in and around Thanet, but also across London and the Southeast. Joe Swing's energetic, heartfelt vocals add a personal touch to your wedding, anniversary party, event or special occasion.